Sometimes all you need is a good dress. As soon as I bought this dress, I just knew I had to show you guys. 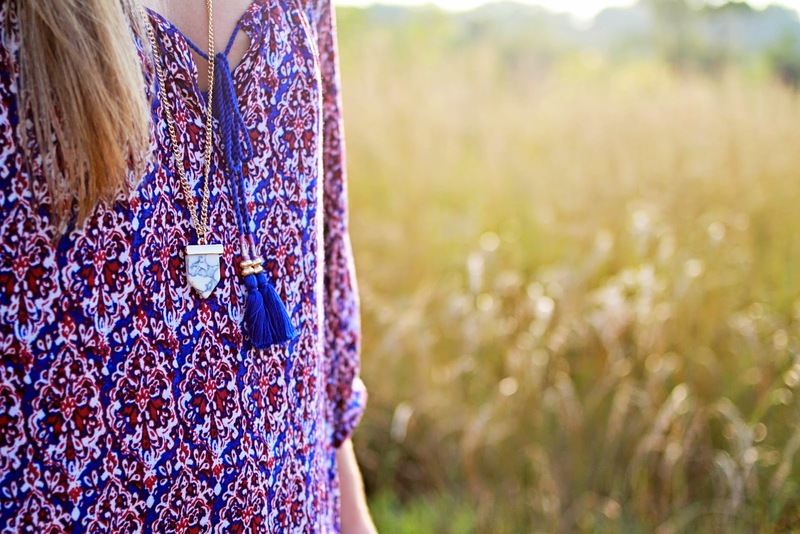 Anything that has tassels and is flowy I'm all for it. With the weather being so hot lately, pants are not an option and a dress is the way to go for me. Whenever I go shopping for a dress, there are certain things I look for. 1| Length: Unfortunately, I am pushing about 5'2", so it can be difficult when trying to find the right length. I tend to go more for flowy dresses simply because if they are too long you can always wrap a cute tassel tie around your waist. This helps shorten the dress. 2| Pattern: Pattern has a big part in my 'yay or nay' decision making. I generally choose a soft pattern when I know I will be accessorizing heavily and a poppy pattern when I am feeling bold. I would say the pattern in the dress I am wearing here is more on the lines of a heavy pattern for me, but I love that it has that 'pop' factor. 3| Sleeves: I know this sounds weird, but I am picky when it comes to the sleeves on a dress. Three-quarter length is my top choice. I can get cold very easily so I prefer to have something covering my arms. I'd love to hear where you guys find your favorite dresses? Hope you all have a great rest of your week, x!